Riding will consist of grooming and tacking their horse and then a lesson and work on improving their balance, influencing their horse, and improving their riding skills. Riders will progress at the rate they are comfortable with. Campers will be split up with riders that are comparable to their riding ability. Most of the riding is done in the arena, and then an occasional walk out side. Campers will have time each day to do a horse related craft to take home at the end of the week. 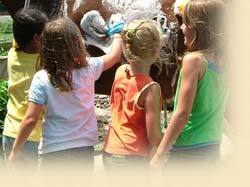 Campers will help out with feeding, giving hay, feed, and water to the horses and other daily farm chores. 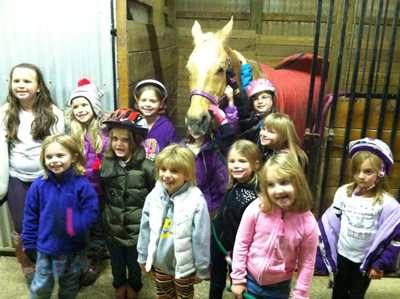 Campers will learn all different aspects of horses; breeds, colors, disciplines, health, hoof care, anatomy ect. Our educational part of camp we take the riders to the barn to get the full hands on experience. Please send your camper with a packed lunch. We do have water cooler and soda vending machine. So please keep in mind their hydration. Pick up is promptly at 3.00. New this year we will offer early and late drop off. There will be an extra fee for this. If this is something that you need, please make note of that on your registration form. There will be a fun show on Friday the last day of camp. This will start at 2pm it is estimated to run about a hour and half. All friends and family are welcome to attend and see what the campers have learned and progressed. Also if there are any campers that are interested in joining our iea team that is for 6 thru 12 graders please let Kathy know.